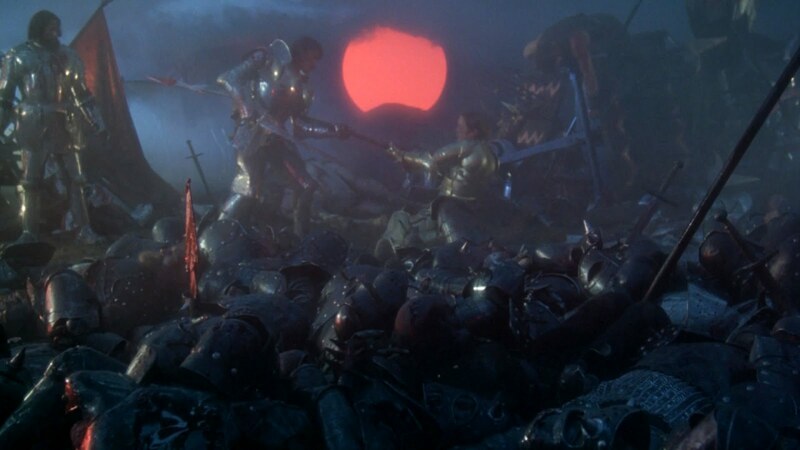 Aside from Boorman's decision to shoot Excalibur in the lush green forests of his native Ireland, or to cast three of his children in pivotal parts in the film, there is another personal aspect to the picture. 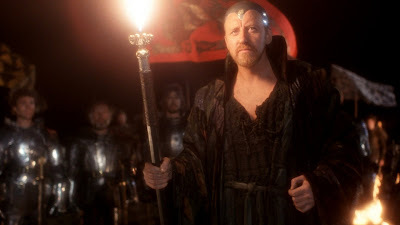 Excalibur shares a preoccupation that first appeared in Boorman's Deliverance (1972) and became central later in The Emerald Forest (1985): the alarming destruction of the environment. To varying degrees, all three films tie history, mysticism and the metaphysical to the dying forest. In Excalibur, this theme slowly comes to the fore, not coincidentally symbolized by the eponymous sword Arthur wields while ruling the land. Whoever possesses the sword Excalibur rules all of England, we hear at various times in the film, most emphatically when Arthur abandons his sword, thrusting it into the ground between the naked bodies of Lancelot (Nicholas Clay) and Guenevere (Cherie Lunghi), asleep after a tryst in the forest. Guenevere wakes up to find the sword, screaming at the sight of it. Lancelot declares, "The king without a sword! The land without a king!" a statement that rings so true midway through the film it seems to echo on and on until the movie's conclusion. Borne out of an aborted attempt to mount an early adaptation of The Lord of the Rings (Excalibur utilized some sets built for that prospective film), Excalibur shares one idea with Peter Jackson's interpretation of that Tolkien story; the same one Boorman has explored elsewhere. As nature and paganism recede into the past — represented by the passing of Merlin (a scene-stealing Nicol Williamson) towards the end of the film — they are supplanted by the world of man and Christianity — represented by the knight Perceval and his successful quest for the Holy Grail, the mythical cup used by Christ at the Last Supper. The movie's characters seem at their strongest during scenes that bridge the mysticism of the past with the new one of the present; one example is the Druid-type wedding between Arthur and Guenevere, at which an image of Christ is prominently enshrined at the altar, a mélange of paganism and Christianity. 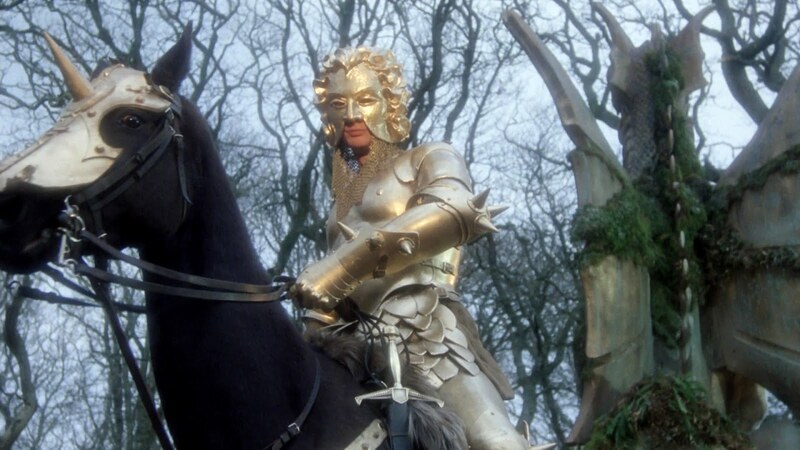 Arthur and the sword Excalibur are symbolically interchangeable, bridging man's pagan past with its Christian future. While Arthur lies heartsick with Lancelot and Guenevere's betrayal, his kingdom lies barren, devoid of life. 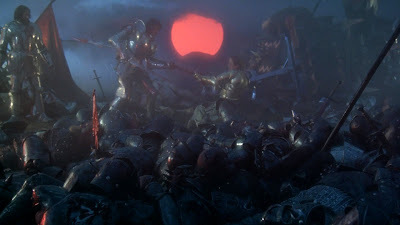 It is only when Perceval returns with the Grail and allows Arthur to drink from it that both king and country are restored in an iconic sequence cut to "O Fortuna" from Carl Orff's Carmina Burana. Meanwhile, the sword, gleaming in the film's predominant color palette of green and silver (representing the tension between the ancient and modern worlds) is often framed to look like a cross, especially at the film's conclusion. The dying King Arthur orders his most valiant living knight, "Perceval… take Excalibur. Find a pool… of calm water. Throw the sword into it." After initially objecting, Perceval gives in and rides off to a nearby lake. But he cannot bring himself to do as his king commands. He returns to Arthur's side, and the king asks, "When you cast it in, what did you see?" "I saw nothing… but the wind on the water." After a pause, Perceval relents, "My king, I couldn’t do it. Excalibur cannot be lost! Other men—"
"Do as I command," Arthur interrupts. "One day a king will come… and the sword will rise again." This is a modified version of an article first published on 3/9/2011 in Nomad Editions: Wide Screen.